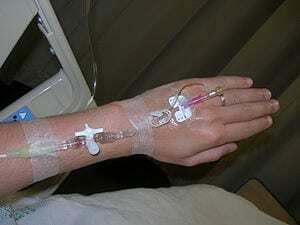 Simply replacing the connector in the IV system in patients with central lines could help reduce deadly bloodstream infections, researchers at Georgia Regents University have found. A central line or central catheter is a tube placed in a patient’s arm or chest to help deliver fluids, blood, or medications through the large veins near the heart. A connector sits at the top of the catheter and serves as the entry point for the fluid pathway inside – any fluid that goes in or comes out of the body, goes through the connector. Most connectors use positive or negative pressure – either pushing fluid out or drawing blood in – when catheters are disconnected for flushing and cleaning. Ironically, it’s during that process – designed to clean the catheter and ultimately reduce the chance of infection – that germs find their way into the bloodstream causing an often dangerous blood infection. Nearly 250,000 central line-associated bloodstream infections happen in hospitals each year, according to the Centers for Disease Control and Prevention. Mortality rates on CLABSIs range from 12 to 25 percent. Treating them also costs health care systems billions of dollars each year. “We know that both positive and negative needleless connectors have been associated with higher CLABSI rates, so we decided to see what role a zero fluid displacement connector would play in infection control,” said Dr. Cynthia C. Chernecky, a Professor of Nursing at GRU and corresponding author on the study published in the American Journal of Infection Control. As their name indicates, zero fluid displacement connectors cause no reflux of fluids – out or in – during disconnection and connection. Researchers analyzed data in six acute care settings in five states and found that the number of infections decreased by 60 percent when positive connectors were replaced with zero fluid displacement connectors and by 94 percent when negative connectors were replaced with the zero connectors for central line IV therapy. “We estimate that replacing the connector devices saved about 13 lives in the acute care settings in this study,” Chernecky said. In addition to saving lives, more than $3 million was saved on health care costs. The average central line-associated bloodstream infection costs about $35,000 to treat. April 19, 2019 - Two Oklahoma Hospitals Fought Off Deadly Fungal 'Superbug' KOSUIt wasn't publicized locally, but within the past few years teams of health officials at two Oklahoma health facilities took rapid actions to contain the. April 3, 2019 - Government subsidies could be key to containing hospital-born infections Princeton UniversityPrinceton researchers propose fighting hospital infections with matching government subsidies for every dollar a hospital spends on infection control. April 19, 2019 - This Care Bundle Cut Pediatric Cardiac Surgical Site Infections by 74% HealthLeaders MediaThe postoperative care initiative at a California-based children's hospital has 11 elements.